"This fascinating, innovative volume explores infrastructure in daily use in a rich variety of ways across different cultures. It furnishes a wonderful way into exploring the centrality of infrastructure to our lives." "All too often analyses of infrastructures focus either on material networks and the services they deliver, or on how to deal with the growing demand for such services. The great merit of this book is to take a more nuanced view and put the co-development of everyday practices, the use of infrastructure-connected appliances and the materiality of infrastructure systems centre-stage." 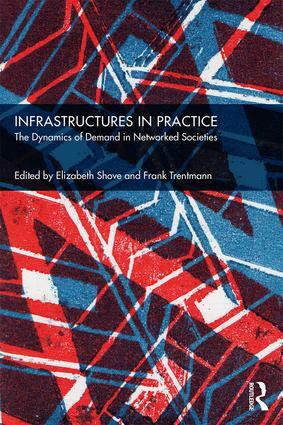 "With an impressive range of cases, methods and perspectives, this book makes visible the different ways in which infrastructures ratchet up the demand for services and energy. The book offers an important way out of the impasse of the conventional separation of thinking about future demand and about the associated need for infrastructure. Instead it shows how infrastructure and demand co-evolve. It has important implications for how we select different pathways for the future." 6. Self-Sufficiency in Architectural and Urban Projects: Toward Small-Pipe Engineering? Elizabeth Shove is Professor of Sociology at Lancaster University and Principal Investigator of the DEMAND Centre (Dynamics of Energy, Mobility and Demand), funded by the Research Councils UK. She has written about the dynamics of social practice, infrastructures, material culture and consumption including The Dynamics of Social Practice: everyday life and how it changes with Mika Pantzar and Matt Watson (Sage, 2012) and The Nexus of practices: connections, constellations and practitioners, edited with Allison Hui and Theodore Schatzki (Routledge, 2017). Frank Trentmann is Professor of History at Birkbeck College, University of London, and also at the Consumer Society Research Centre, University of Helsinki. He was the Principal Investigator (PI) of the 'Material Cultures of Energy' project funded by the Arts and Humanities Research Council, UK and is also a member of the research centre DEMAND. His latest book is Empire of Things: How We Became a World of Consumers, from the Fifteenth Century to the Twenty-First (Penguin, 2016) with several foreign translations.